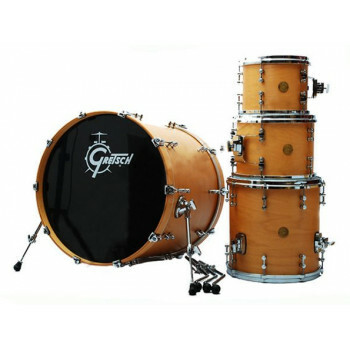 Gretsch-formula maple shells. Proportionate shells that increase in thickness as shell diameters increase. Low profile ITS suspension system. Low-mass vintage styled tube lugs. Die-cast hoops on all the toms and the snare drum. 30 degree bearing edges. Single tom arm with clamp. At a time when Retro is as hip as ever, Gretsch embellishes the retro vibe by offering this true professional drum shell pack; the New Classic Maple 4-Piece Shell Pack. Featuring proportionate Gretsch-formula maple shells, this shell pack produces vintage tonality while producing a very distinctive sound. Proportionate shells increase in thickness as shell diameters increase to give a full, balanced tonality across the entire drum set. Classy appointments include vintage styled tube lugs, the very low mass ITS integrated tom suspension system and 9025 hinged tom and floor tom leg brackets. Retro looks combined with hip innovations,. . . a true New Classic.